We bring forth the finest quality Hydraulic Vane Pumps in the national as well as international markets. The Denison Hydraulics Vane Pumps that we offer in the market is known for their long lasting and hassle free functional life. They require low input power for the function and are operated with very low level of noise. Our hydraulic vane pumps have the same mountings and specification as that of the Vickers. They are available in different models and specifications as per the requirement of the clients. Their 12 vanes designs are for the industrial application and 10 vanes designs are available for the mobile applications. 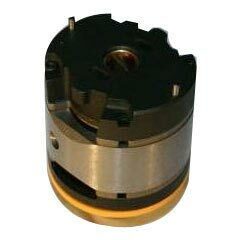 Besides, we are the most eminent Heavy Duty Hydraulic Vane Pumps Importer in India. Model : T6C, T6D,T6E,T6CC,T6DC,T6EC,T6ED,T7 Series,T6DCC Cartridge kits,shafts,seal kits, complete pumps available ex stock. Models : Complete Pump Units (V/VQ) 25V,35V,45V,2520V,3525V,4525V,4535V,3520V,4520V One to One Replacement of V/VQ Vickers Series for Industrial/mobile Applications. We offer imported Vickers equivalent Cartridge Kits & Original Denison Cartridges kits for Mobile & Industrial applications. .The vane design with self compensation for wear and clearances make volumetric efficiency of pump nearly constant over service life.The intravane design of the vane pump keeps the vanes in constant contact with the cam ring.Even at higher speeds & pressures this self compensating vane tip wear feature provides high performance over life of the pump.Cartridge kits are the primary way to service the pumps to restore the pump performance,lower the replacement cost and reduce downtime.Cartridge Kits of Vickers 20V/VQ(5,8,11,12,14 GPM),25V/VQ (12,14,17,21 GPM),35V/VQ (25,30,35,38 GPM) & 45V/VQ(42,50,60 GPM) series are used to service single & double Vickers vane pumps of series 2520V,3525V,4525V,3520V,4520V etc.The cartridge kit is independent of the shaft allowing for easy change of flow capacity and field servicing without removing the pumps from its mounting.